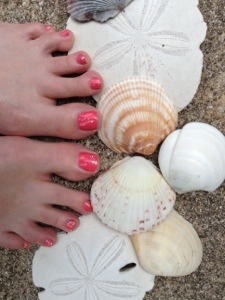 I painted my toes beachy summer pink today and then added sparkles. Partly because I’ve been seeing all the teenagers with their sparkly nails leftover from prom and partly because I’ve been in a funk and they made me happy. Then I thought…”Am I too old to pull this off? It’s weird how much that thought has crossed my mind this year. I wanted to join the pastel pant trend. It left me debating (the pink pants won out in the end). 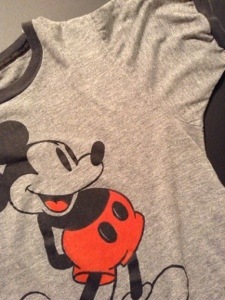 I have a vintage Mickey Mouse tee I have been hoping to someday fit back into. Which leaves me wondering if my efforts are only going to end with me looking ridiculous. The other night…. Man: “now that you won’t be teaching, I think you should dye your hair bleach blonde, cut it short, and get that nose stud you’ve talked about”. When do we reach an age where we should just hang up some of our rebellious urges and admit, “we’re someone’s parents. We should really act like it”, or do we say, ” forget it! I’m going to do this, wear this, listen to this because it makes me happy”? When my pledge class all went and got tattoos and I decided not to, (in my head) I was thinking responsibly. No risk of infection, no pain from needles, no permanent marks I’ll regret later. When I decided getting a piercing before taking a teaching job wasn’t worth the hassle, I thought I was being practical. At what point do we go from acting like an adult to just being boring? If there’s an outfit that is a little too, low/tight/short, do you forgo it for the Oxford because you’re a mom? At what point should the what if factor out weigh the what the hell factor? BTW – if I ever get back into that tee, I’m wearing it proudly…it’s sooooo soft.